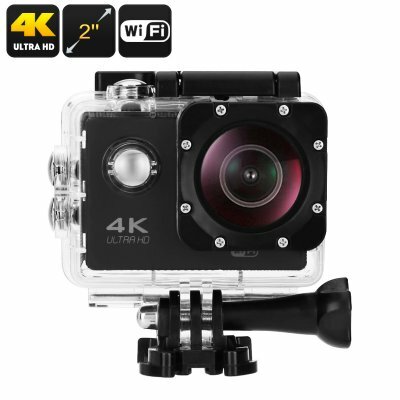 Successfully Added 4K Sports Camera - Sony 179 Sensor, 30fps, 170-Degree Lens, 16MP, IP68 Case, HDMI Out, 2-Inch Display, App Support to your Shopping Cart. Capture your upcoming adventures in stunning 4K resolution with this action camera. This 4K sports camera can be easily attached to your helmet or equipment. It additionally comes with an IP68 waterproof case. This allows you to use it for extreme water sports or to shoot stunning 16MP photographs while scuba diving during your holiday. From now on, you’ll be able to capture all those special moments in stunning resolution. WiFi and App support let you easily share your files onto your smartphone after which you can send them to friends and family back home. Whether you’re into skiing, diving, or mountain biking – this 4K sports camera will follow you anywhere you go. Thanks to its Sony 179 sensor, this sports camera is capable of producing highly detailed images. You’ll be able to snap breathtaking 16MP photographs and 4K video at 30fps. This will provide you with Ultra-HD media that truly brings forth the intensity of every moment. On its 2-Inch display, you’ll be able to watch back recordings instantly. With 32GB external memory support, this 4K action camera supports more than enough storage for you to keep all your recordings. If you are looking for a way to capture your sports games or upcoming holiday adventures, this 4K camera is the perfect gadget for you. Within its small body, this compact 4K camera holds a 900mAh battery. This cell brings along plenty of power for you to shoot Ultra-HD video for up to 2 hours in a row. The App is supported by both iOS and Android smartphones. Thanks to this, you’ll be able to use it with the vast majority of cell phones out there. The 4K sports camera furthermore features an HDMI out port to hook it up to an external display. Starting from today, you’ll be capturing great memories with this stunning 4K action camera to ensure that not a single special moment in life ever gets forgotten again. This 4K cam comes with a 12 months warranty, brought to you by the leader in electronic devices as well as wholesale electronic gadgets..